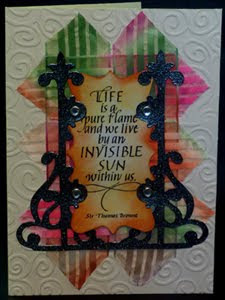 This week on Created By Hand and Quietfire Creations the challenge is to use Peace or Ribbons & Bows. Can you guess what I used BIG GRIN. Love this ribbon. It just is so bright and happy looking, especially on these dismal days we're having in Calgary. Hi Yogi...I have a message on my blog for your blog. That ribbon is fabulous and I love the way you used the post die! This card is beautiful, I love the bright coloure against the white background.